Our names are Bridget and Alyssa. This summer our job is to create a guide for your Boston Harbor experience. We will be helping you discover the best of the harbor and the many activities it has to offer. It is our goal to make sure you have the best summer possible out on Boston Harbor! For our first entry, the activity that came to mind is, of course, where to find the best harbor food for your beach adventures! 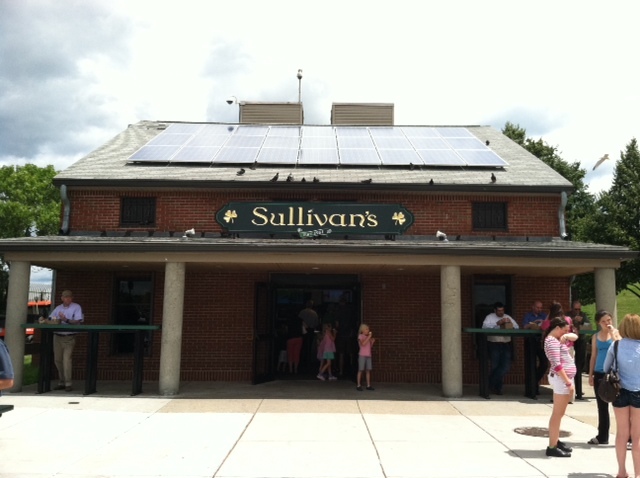 In considering both taste and cost, we came to the conclusion that Sullivan's, located in South Boston on Castle Island, is a perfect harbor eatery. Sullivan's, first established in 1951, provides all of your classic beach eating favorites, such as burgers and milkshakes, at very reasonable costs. Among other favorites are their hot dogs and their french fries. Conveniently located at the end of Carson Beach, on Pleasure Bay, Sullivan's has easy access to fishing and swimming destinations. Customers eat at outdoor tables or in the shaded grass near Fort Independence. If swimming or fishing is not for you, Fort Independence is a great place to explore and learn about Boston History. Fort Independence, first constructed in 1634, is the oldest fortified area in the United States that is of British origin. Whatever your plans, Sullivan's is a must-visit summer location. For more information click here. Enjoy! My first year with STH! Kicking Off the Summer on Constitution Beach! Good Weather. Good Fun. Great Day! All Aboard for The Youth Partners Breakfast!